Today being Diwali, the day when people in India celebrate the festival of lights, I thought I'd keep my post traditional but different. Diwali is a Hindu festival that celebrates the triumph of good over evil and the goddess of wealth, Lakshmi is worshipped to bring prosperity and fortune to families. Diwali is by far, one of the most gorgeous festivals in India, entire cities and towns are lit with oil and candle lamps and children celebrate with dazzling fireworks. Food is a huge part of this celebration and every sort of decadent dessert and meal is a part of this glorious occasion. As a kid, I was fortunate to have the best of both worlds when it came to Hindu and Christian holidays due to my parents, I remember the fireworks and the gifts but more than all of that the dinner has left an indelible mark in my memory. Huge elaborate meals were carefully planned and painstakingly prepared that everyone would sit down to enjoy and partake in laughter and fun conversation. My initial thoughts centered around sharing an Indian dessert but then I said to myself my blog is all about being traditional yet non-traditional in every aspect just like me! 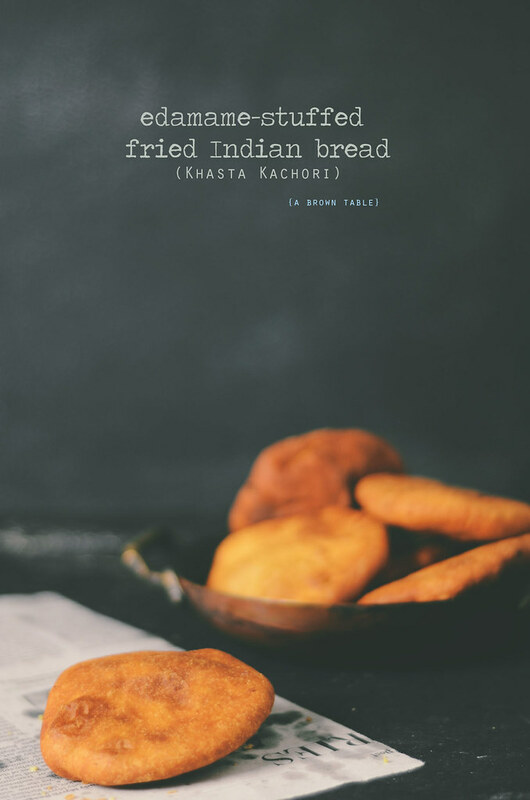 I've been wanting to make these deep fried stuffed breads for a while that are also known as Kachoris. Kachoris are usually filled with a spicy lentil stuffing and are an extremely popular appetizer served at any celebration or event or even simply eaten as a snack with chai. The pastry crust of these breads is flaky yet light that makes them a fantastic treat for everyone alike. Kachoris are so easy to make and you can practically fill them with almost anything you can think of. 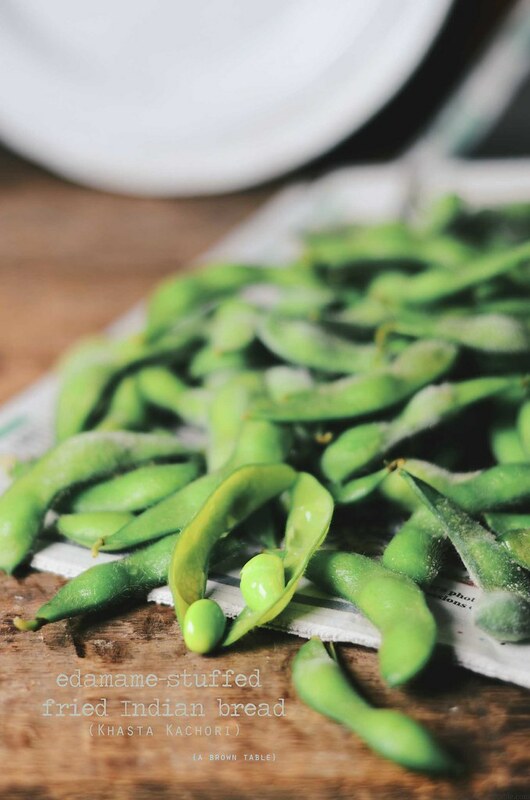 My version has a spicy edamame-filling that is delicious yet simple to prepare. For the edamame, I just boil the raw edamame in their pods, then peel and shell the beans out. You can serve them with my sweet tamarind chutney or my cilantro mint chutney or serve the kachoris with both. 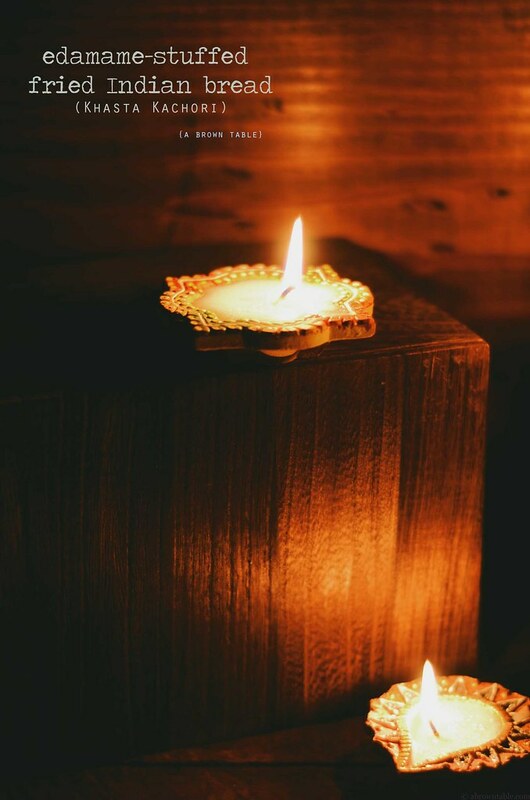 So have a happy and wonderful Diwali and remember to light a candle or lamp tonight. 1. In a large mixing bowl, whisk the flours, salt and baking soda. Pour the oil and mix evenly with your hands for about 4 minutes until the flour has absorbed all the oil. The flour grains will get a fine crumb like texture. Add the chilled water and start to knead the flour until a smooth silky dough is formed. Cover this dough with cling film or a damp kitchen towel and let it rest in a cool place for at least 30 minutes. 2. In a food processor grind the edamame with the chili, cumin and salt to a coarse paste. 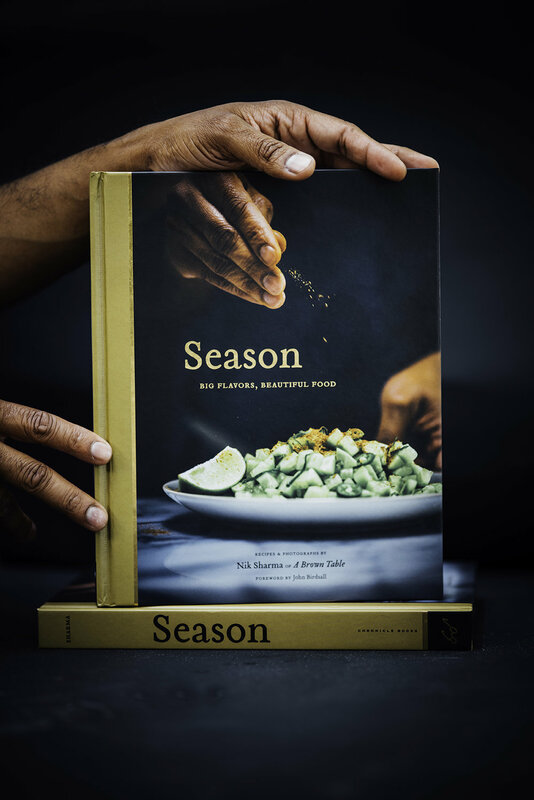 Taste and season with more salt if desired. Keep aside. 3. Divide the rested dough into 10 equal balls about 1 inch in diameter. Take one ball and place it on a lightly floured surface. Roll the ball out into a flat disc that is approximately 3 inches in diameter. Place about 1-1 1/2 teaspoons of the edamame filling in the center of the disc. Using your fingers, pull the edges over the filling and pinch to seal the open end. (This is similar to preparing stuffed wontons). Flatten the stuffed pastry between the palms of your hands taking care to prevent any cracks from forming. Repeat with the rest of the balls, dust lightly with flour and keep aside covered with a damp cloth until ready to fry. 4. Heat enough oil in a deep fryer or wok on a medium-high flame. When the oil begins to smoke, carefully slide one pastry into the oil. Press it gently with a slotted spoon for 10 seconds to help it puff up. Let the pastry cook on each side for at least 30 seconds or until evenly golden brown on each side. Remove the fried bread with a slotted spoon and place it on a plate or dish lined with a clean paper towel to absorb any excess oil. Repeat and continue with the rest of the breads. Serve hot with sweet tamarind chutney or cilantro mint chutney or both. 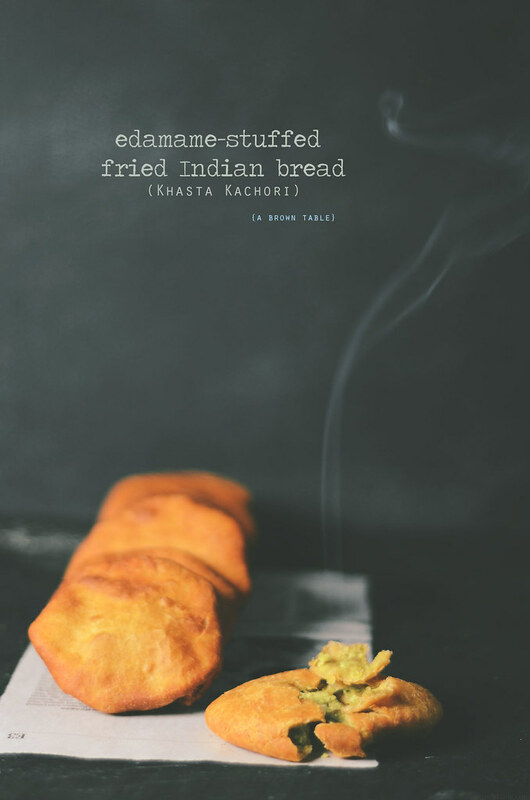 In "Bread", "Diwali", "Edamame", "Indian", "Kachori", "Vegan", "Vegetarian", "deep-fried", "pastry"